I am going to the Giro d'Italia in Northern Ireland! This proclamation always elicits a response of puzzlement and then that familiar silent head-tilt as if to say,"Isn't that a long way from Italy?" 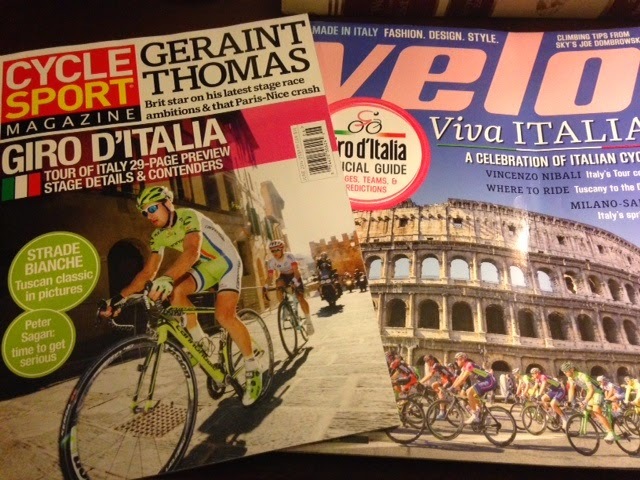 Yes, the start of the Grand Tour Giro d' Italia is a long way from home in 2014, as the bird flies it is 1660.2 miles away from home soil and all those vineyards. 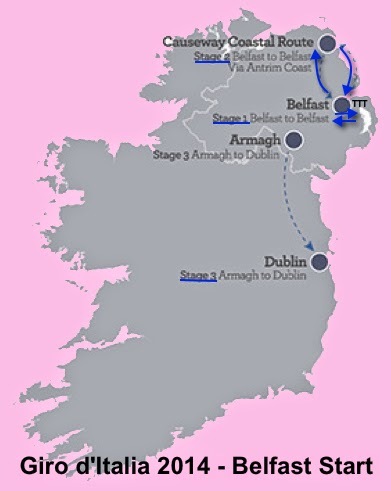 The first three stages of this year's Grande Partenza (Big Start) of the Giro will take place near Belfast, Northern Ireland. Followed by the peloton's return, over a rest day, 1796.4 miles back to Giovinazzo, Italy, where they will resume racing. Why am I going? I wanted something new and it's Ireland! My family is from Ireland, I am holding an Irish passport in my hands that needs to return to Ireland, the tourist options before and after the race are very appealing to an American, it is NOT in the height of summer travel in Europe (as is the Tour de France), my dog already has a place to stay with family in California (awaiting the Tour of California), and the trip seemed quite doable. Plus my parents had a boat-load of flight miles just waiting to be used (thanks Mom&Dad!). 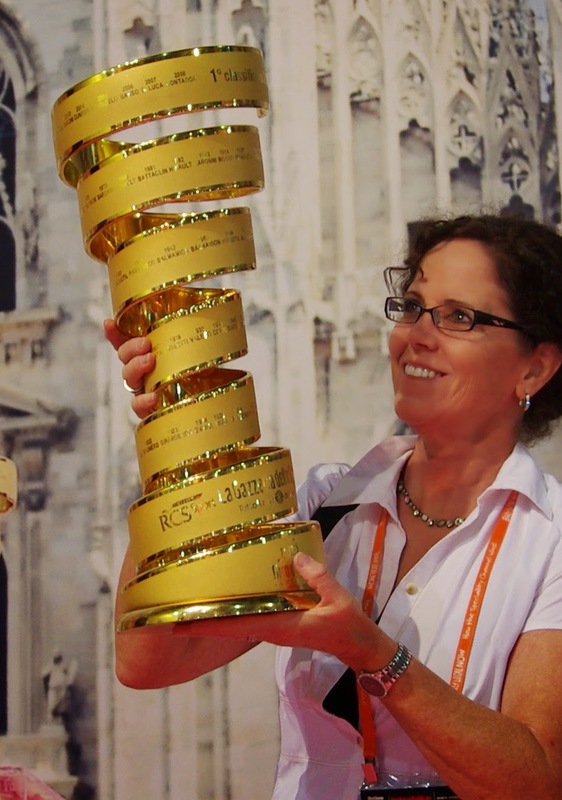 I have always wanted to see the Giro, but in my mind going to the Giro in Italy would entail combining days at the race with mandatory epic cycling (and since I am no longer the rider I once was since breaking my pelvis, the appeal has lessened). Add the perceived nightmare of accommodations and travel logistics to the required time off of work of at least two to three weeks and the word headache pops to mind. So when I saw that a Team Time Trial (something I have always wanted to see in a grand tour) would be Stage 1 in Northern Ireland, I thought "I'm going," it was that clear. Plus after reading through all the website information for fans - this looks like tremendous fun! And I really just want to go listen to Irish pub music and drink Guinness beer. 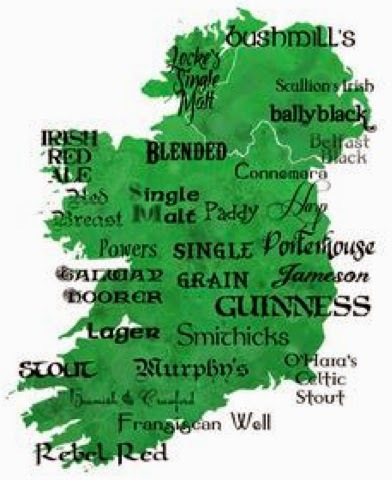 My preferred map of Ireland. Although my grandmother wouldn't approve, she hated when people assumed all Irish drink, she did not. I do. This will be the 97th edition. Since 1996 there have been 7 foreign starts to the Giro d'Italia, but this is the first time the race has left Continental Europe. The Giro traditionally begins on a Saturday, but because an extra rest day was needed to transport the riders and staff (although many teams will have staff for Ireland and a separate staff for Italy) back to Italy, this year the Giro begins on a Friday (the team presentation is Thursday). Dublin hosted the start of the Tour de France in July 1998. It was the same year the Good Friday Agreement was signed a few months earlier that April. 1998 was also the year of the Festina affair when a team soigneur was stopped on the Belgian-French border with illegal doping supplies found inside his car. The start in Dublin began under tremendous controversy. We have come a long way in sixteen years. Who will be in the pink jersey (maglia rosa) in Belfast? The leader of the winning time trial team on Stage 1 will be awarded the pink jersey (perhaps Pieter Weening or Wout Poels). The jersey will likely change hands to a sprinter after Stage 2. Marcel Kittel will be racing the Giro in 2014, Mark Cavendish will be racing the 1-week Tour of California instead of the 3-week Giro. 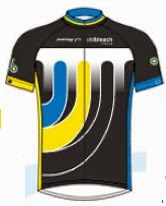 I hope to see the jersey on the back of a different sprinter after Stage 3, unless the breakaway manages to stay away. The second week of the Giro is filled with medium mountain stages. The big mountain stages are saved for the third week of racing, when the real winner of the Giro should emerge from the leaders established after the ITT of Stage 12. This is Titanic Belfast the location of a large exhibit (the architecture is supposed to represent bows of the ships) built to celebrate the port where the ship Titanic was built. Nearby is a large paved area suitable for accommodating team buses and broadcasting trailers and trucks of equipment necessary for the production of an enormous bike race. I particularly enjoyed the section on the official Giro guide stating the preferred "wine" of Ireland was Guinness. Very creative GiroStart cab graphics in Belfast. All this pink lets a visiting fan and cyclist know they are welcome in town. 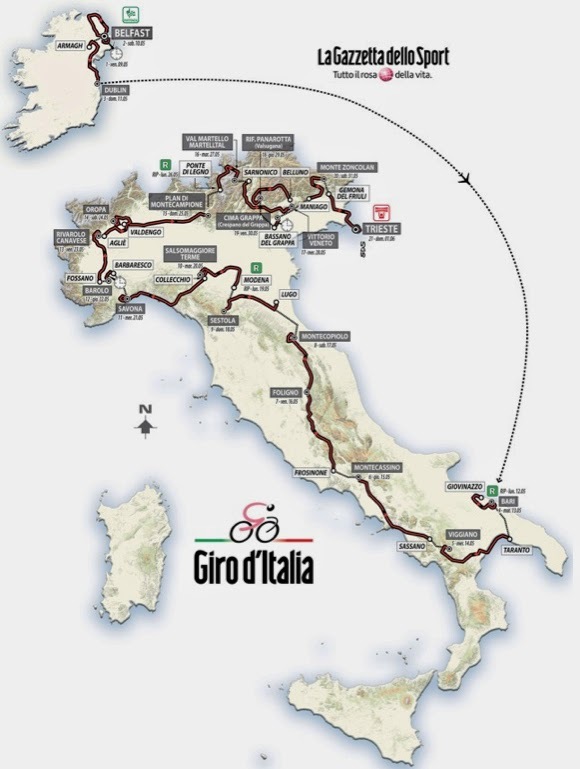 I hope this post helps you plan your trip to the Giro d'Italia in Northern Ireland. The initial part of my trip came together quite easily making me realize being a simple tourist is a breeze, combing tourism with an enormous bike race in a foreign country, is a different beast all together. It was refreshing to find flight mileage available for flights and plentiful hotels or friendly B&Bs (unlike France in July). Natural sites and tourist sites appear both relaxing and entertaining. Realizing I have to drive on the wrong side of the road, not so much. Next I started planning for the race and was so pleasantly surprised to see tons of information for fans, more than I have ever seen for any race. Can every other race organizer please learn from what the citizens of Ireland have accomplished! Still I began to wonder - does anyone in Northern Ireland do what I do for local races and events? I need a locals perspective. Race day facts can rarely be found on official Grand Tour websites, they typically leave those details up to local cities. The race organizer's purpose is to promote and market the race itself; they present fancy graphics and videos, and much talk of riders who will attend and who will win. 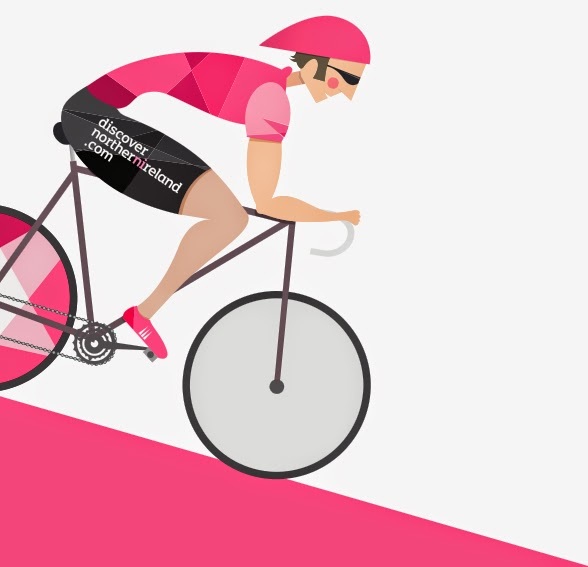 In the case of the Giro, they also use a lot of pink, although a nice color, none of this is of great help to the little guy out on the road. What percentage of fans come from out of town to visit bike races? A lot. Yes, I plan to discover Northern Ireland. This is Freddie Forte (Strong Freddie) (I'm not sure why they didn't call him Pedaling Paddy) the official character of the Giro Start. Strong Freddie even has a cookbook. Northern Ireland has done an excellent job of getting the information out there to fans, although it took some surfing on various websites to make sense of it all. A lack of detailed information for the cycling fan is traditionally a problem, and is exactly why I began my guide to races like Tour of California (my home state) and USA Pro Challenge (my resident state) and France (my adopted state). Every time I spend 3-hours learning some small detail, I want to share it to save others the time. I want to put my hundreds of hours of research, often learning the hard way how not to do things, to good use. When it comes to the Giro Start in Belfast, I can happily state Ireland has laid out the red carpet for fans to attend this race. Since I am embarking on this trip on my own, Northern Ireland will be another huge learning experience for me. One thing I know for certain is that locals know best. I believe the Irish to be friendly and funny (that is when I can understand them), so I was thrilled to stumble upon a welcoming post by the Old Bleach Cycle Club in Randalstown (http://www.oldbleach.co.uk). In this post the team encouraged visitors to come to the race and welcomed anyone to contact them, so I did. I will gladly accept help from local experts who also happen to be cycling fans and cyclists. 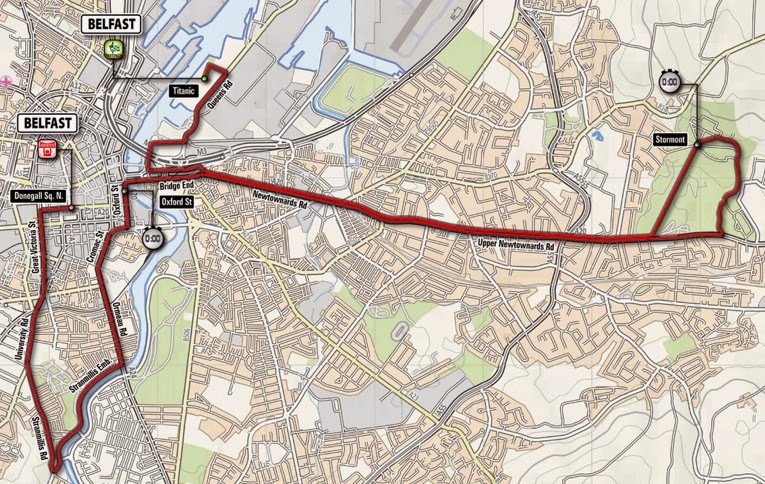 Through the Old Bleach Cycle Club website I discovered the stage guides for the Giro Start Belfast and from there I found much more. A teammate responded promptly to my email and helped answer my questions about where to watch the TTT in Belfast. 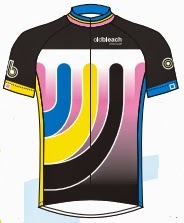 The friendly folks from Old Bleach Cycle Club wear these bike jerseys (the pink one is their custom commemorative Giro jersey), if you see them, give them a hug for me. Pedal Dancer note: Fortunately I happened to notice on Facebook that I could state my interest in tickets for the event, I then received an email with details to sign up online here (since I am not there in person), in what I imagine will be a huge rush for tickets at 9am on April 24th (2am in Denver!). 17:45-20:00, TTT 21.7 km (13.48 miles), route map, route profile, official timetable itinerary, stage guide, video tour of Stage 1! Pedal Dancer note: I had no idea where to watch the TTT in a big city. Thanks to Old Bleach cycle Club and Belfast City Bike Tours, I now have a better feel for the route. 10:50-16:10, 218 km (135.46 miles), route map, route profile, official timetable itinerary, stage guide, video tour of Stage 2 ! Pedal Dancer note: Seeing a race out on the road is easy, I picked my accommodations to be able to see the nearby final climb for more atmosphere and fun, and less hassle with road closures. 11:20-16:13, 187 km (116.2 miles), route map, route profile, official timetable itinerary, (better Timetable and road closure schedule reflecting 11:20 start time), stage guide, video tour of Stage 3 ! Pedal Dancer note: Attending a start is usually straight forward. Parking is always a hassle and walking a distance to the start zone is a given, but arriving with team buses is fun. From there it is a matter of being closed out of the best viewing by VIP blockades but working my way around it somehow to a place where I can watch the riders roll back and forth to sign-in. I like the activity at a Start and feel it balances the experiences of attending a TTT, finish or seeing the peloton pass over a climb. Timetable and road closure schedule for Stage 3 in Armagh, UK. Start Village and assembly point at Shambles Market near Saint Patrick's Cathedral. Roads near market close at 7:00, other nearby road closures in Armagh at 8:30. Team buses arrive at 9:30. Caravan departure at 9:40, Peloton Start at 11:20. Finish in Dublin 14:30 caravan, 16:13 peloton. The caravan will precede the peloton by 1.5 hours when roads will be closed. - The Fan Park will be located at Hamilton Dock, beside SS Nomadic, on Thursday May 8th 13:00-17:30 (before team presentation), also Friday, May 9th 10:00-20:00, and Saturday, May 10th 8:00-18:00. - The Team Paddock will be located at the slipways behind Titanic Belfast - Friday 9:00-20:00. On Saturday the teams will arrive at the Paddock between 8:30-9:30 for Stage 2 Start. - There will be 5 large screen TV at Stormont for fan viewing of the race live. How to watch the Giro live on TV? BBC NI to broadcast TV coverage live for all 3 stages of the Giro: Friday, May 9th 18:30 BST; Saturday, May 10th 14:00 BST; Sunday, May11th 14:30 BST. Rail & Bus: Translink will operate additional capacity on rail and bus services from to get people home following the event.There will be a shuttle train from Central Station and Great Victoria Street to Titanic Quarter Station. Translink will operate a shuttle bus from Belfast city centre to Titanic Slipways from 09:30 onwards. Italy: Androni Giocattoli, Bardiani-CSF, Cannondale, Lampre-Merida, Yellow Fluo. And then of course there are these two magazines that came in the mail this week. 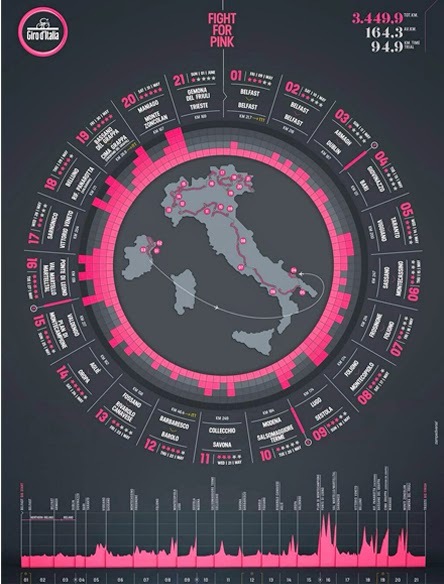 This Giro route map might look cool for marketing, but does nothing for the tourist attending the race. 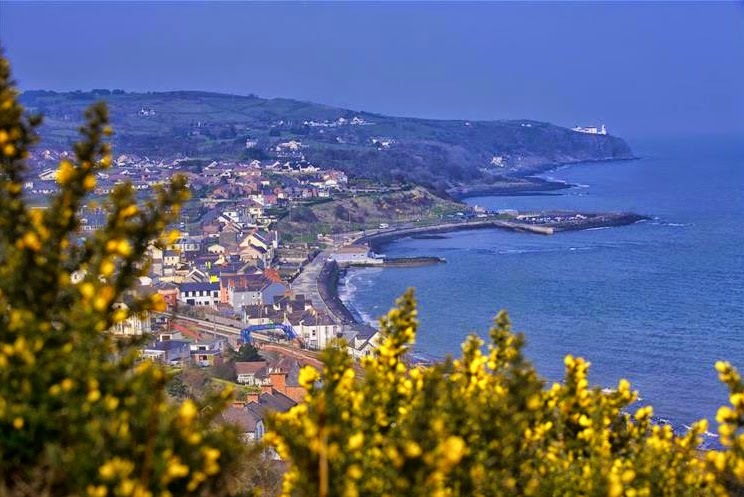 The town of Whitehead north of Belfast where I will be staying to play tourist and fan. May 6: Arrive into Dublin, pick up a rental car and attempt to change my brain pattern to be able to drive on "the wrong side of the road." Drive north to Newry where my Grandfather Peter Mallon was born in County Armagh, proceed through Belfast to Whitehead where I am staying at a friendly B&B along the coast north of Belfast for five nights. From here I can take a 35-minute train into Belfast. Less time than it would take me to find a parking space in the city. May 7: Be a tourist in the beauty of Northern Ireland. 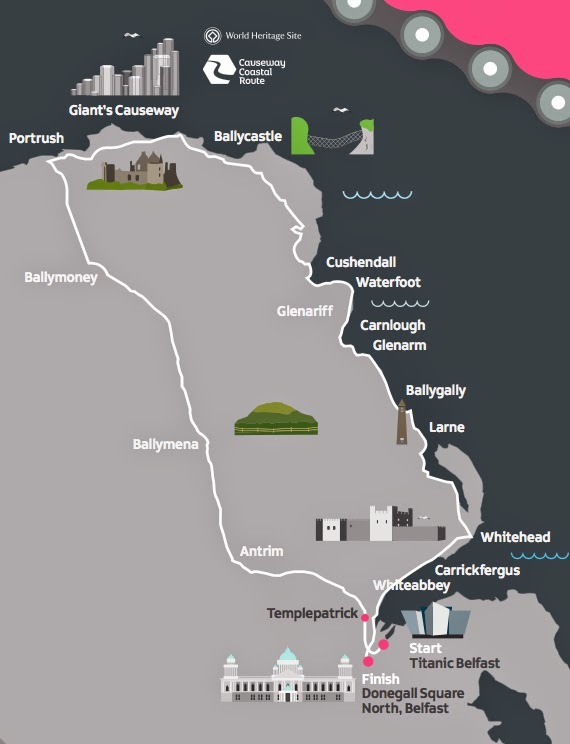 Drive to the Giant Causeway for a hike, visit the Bushmills distillery (yes, I am a whiskey drinker), climb across the Carrick-a-Rede rope-bridge, see The Dark Hedges, drive down the Glens of Antrim continuing the loop drive back to my B&B in Whitehead. May 8: Train (train schdule) to Belfast. Pick up my team presentation tickets at Visit Belfast Welcome Centre (which I hope I get by signing up on April 24th at 2am!/ 9am in Belfast here). City Bike Tour with Belfast City Bike Tours to preview the TTT course by bike. visit Dave Kane Cycle and Il Pirata restaurant for a coffee. Attend Team Presentation at City Hall at 17:30-21:00. 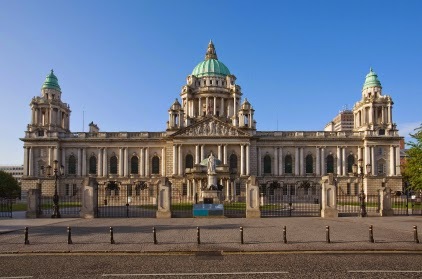 May 9: Train to Belfast, watch the TTT practice 10-12pm in Belfast City. Titanic Belfast Exhibit & Giro Fan Park.Visit the team bus area, watching the riders warm up. Caravan parade at 16:30. Stage 1 - TTT begins at 17:45. return to B&B in Whitehead. 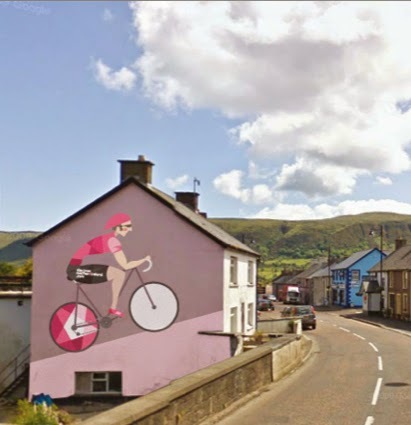 May 10: Watch the final Class 4 climb (with 23.6 miles to go) of Stage 2 at Knocknaguillagh (Bla Hole) nearby my B&B (road closes at 1:00, caravan 14:00, peloton 15:30, road reopens 16:30). May 11: Drive to Armagh for the start of Stage 3 at The Mall/Shambles Yard. Team buses arrive at 9:30am. Caravan departs at 9:40, Start at 11:20. Drive SW to Galway Bay area to the small town of Doolin where I will stay at a B&B for two nights. Local pub music in the evening. May 12: Walking Tour of the Cliffs of Mohar and local sites. Rent a bicycle if weather permits. More local pub music. May 13: Be a tourist in County Clare (my Grandmother Julia Griffin was actually born south of here in Tralee, County Kerry); return to Dublin. May 14: Fly back to Los Angeles where the Amgen Tour of California will already be under way with it's entourage traveling from northern California to southern California. A number of key riders will be racing in California in preparation for the Tour de France. If you are an Irish local and can offer me tips, please comment on my Pedal Dancer Cycling Facebook page - thank you, I appreciate your help! See you at the Giro - in Northern Ireland. I got to hold the trophy! There is even a garden guide of what to plant, in a pink palette of course. Giro Pink Planting suggestions. I tell ya, they have thought of everything! And yet Another promo video #2. And another one promo video #3. I am a sucker for these videos, they get me so pumped up for race time.